When the huge Nor’easter was barreling down on Boston a few days ago, we thought it best to put out some extra bird food (Cole’s Hot Meats, Blue Ribbon Blend). The platform and hanging feeders work well, but when the wind is blowing hard they tend to be difficult for the birds to feed off of. This was why we thought it a good opportunity to put up the new cattail feeder from Gardener’s Supply Company. The Gardener’s cattail feeder is attractive and well designed. It has a cap at the topwhich twists off for easy filling. The support rod is made up of a few sections that screw together to form one long pole. The whole unit stands about three feet tall and will hold about half a pound of sunflower seeds. Everything is power-coated so it should stand up to the elements. 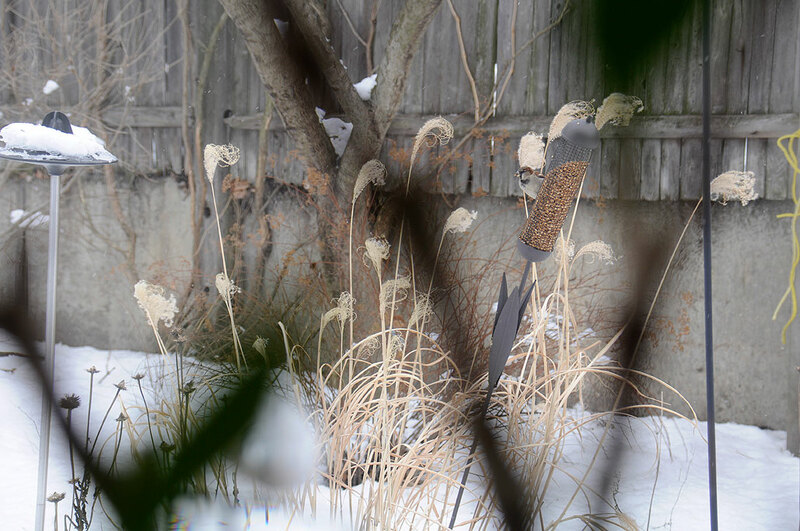 The mesh on the cattail feeder allows the birds to cling on easily, even when the weather is really nasty out. It took the birds about six hours to empty the feeder of all the Hot Meat seeds. We filled it with the spicy blend just in case any squirrels decided to crash the party. 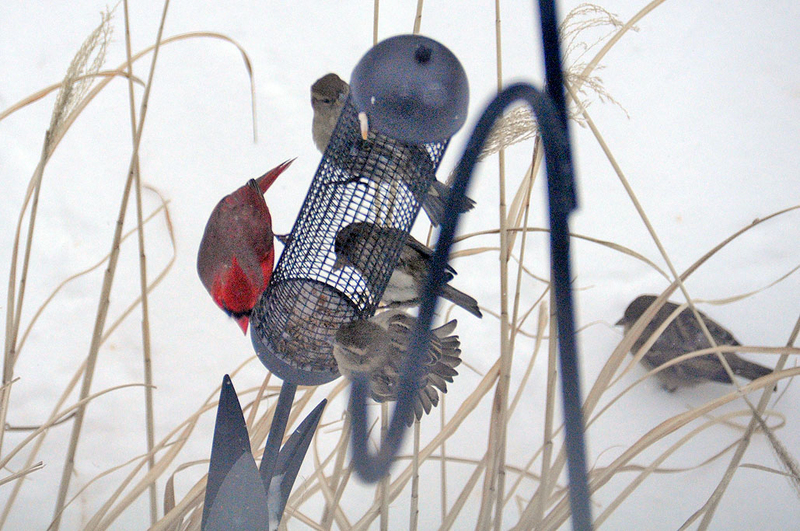 Of course, the cattail feeder was not the only thing out there for them. Hanging nearby on the cherry tree was a block of the Cole’s Blue Ribbon Blend suet. The extra energy from the fat is appreciated by the birds in the cold weather. Because we let Eliot and Milo freely patrol the grounds, we feel obligated to provide plenty of cover for the birds. The forsythia shrub and hydrangea bush are shaped to offer a dense “way station” for the birds to perch in safety. The bushes may look empty, but a quick count shows that it is just not so. 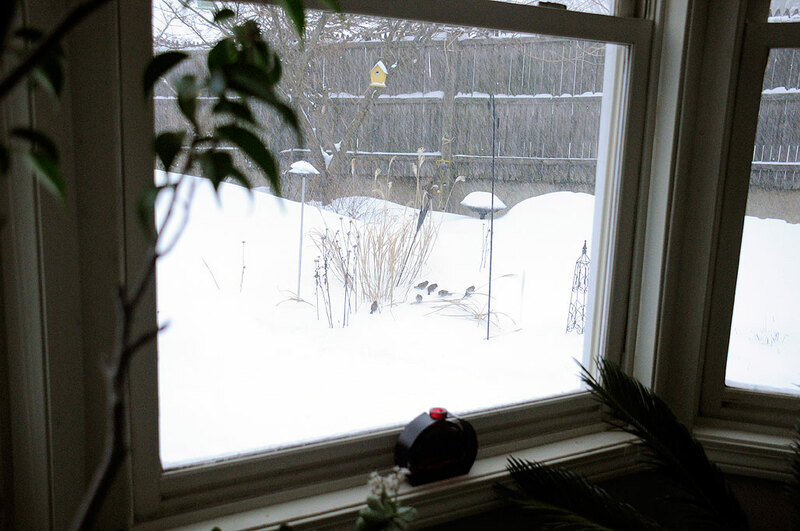 During the blizzard, the birds use the bushes as a windbreak while waiting for their turn at flying out to the feeders. 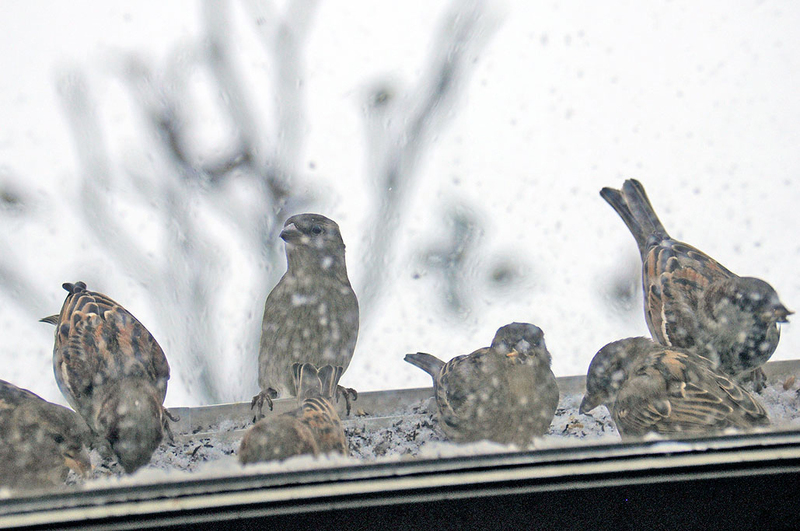 However, the suet one is not as accessible, and with the cattail feeder empty, many made their way up to the feeder on the second-story window later in the day. 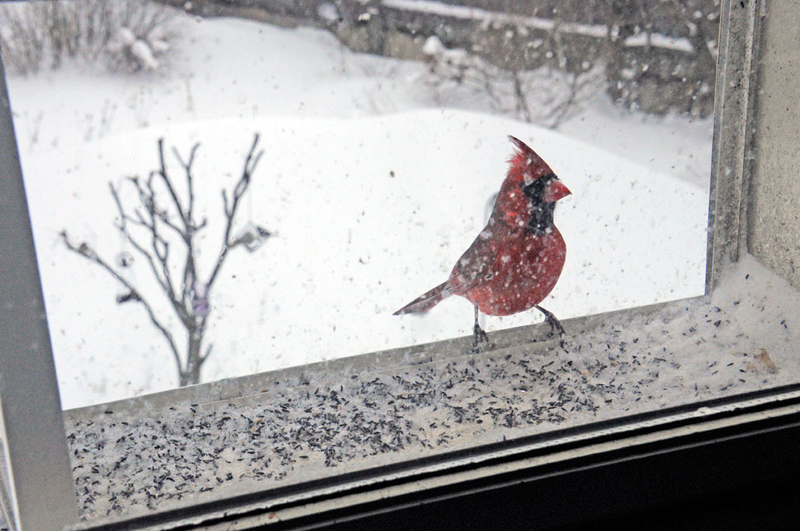 While harder for the birds, we like the window feeder. It is easier for us to refill and we get a much better view of the visitors. This January storm was a record breaker for New England. It dumped closed to three feet of snow in some parts of MA. The Cape got over 24″. The weather people are predicting another storm for Friday and maybe one more next Tuesday. Clearly there is a long way to go before Winter is over. 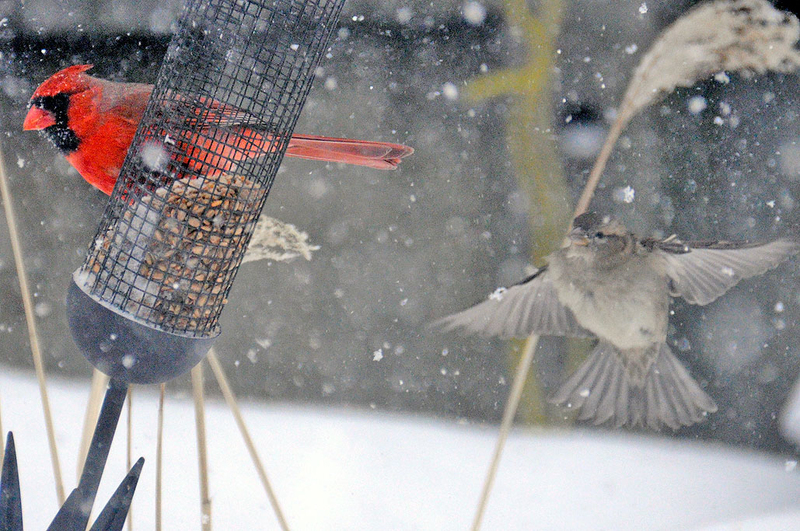 The birds who hang around are pretty tough, but we like to put feed out to make it a little easier for them. They more than repay us with their songs and by reminding us that Spring is on the way!